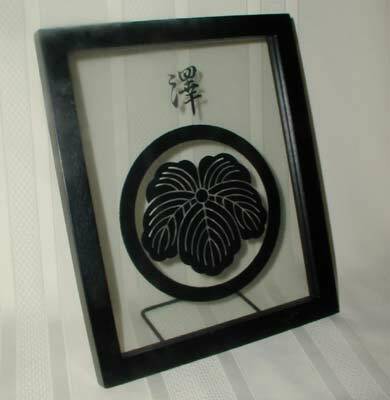 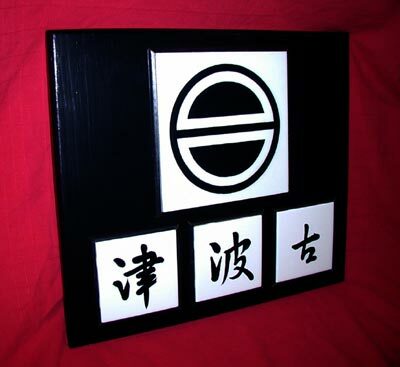 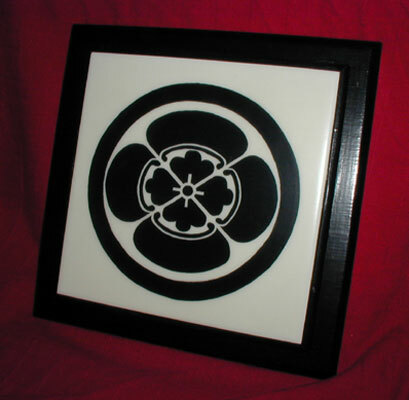 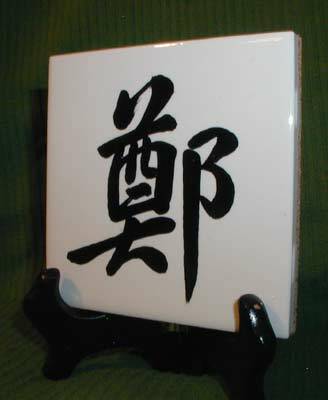 The Japanese family crest, known as ka-mon, is a symbol signifying family roots, tradition and background. 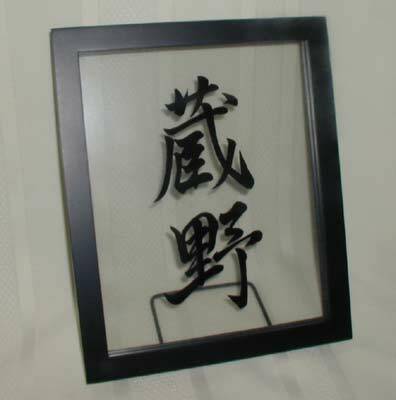 InCharacter Calligraphy creates elegant ka-mons for proud families. 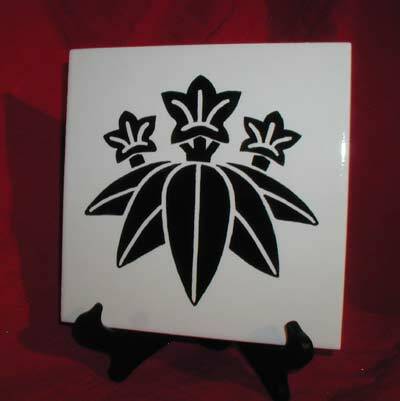 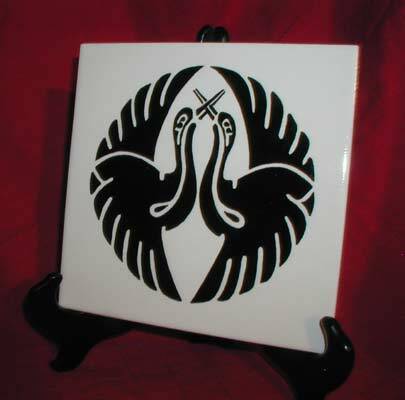 The plaques shown below consist of mons painted on 8"x8", 6"x6", or 4"x4" white tiles optionally trimmed with delicate black moldings. 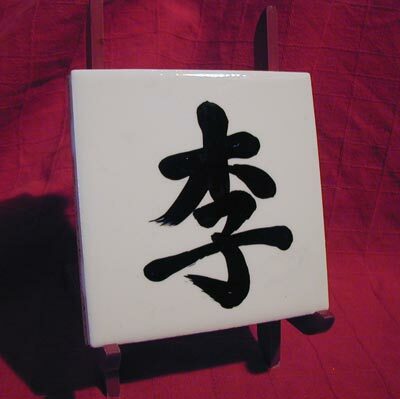 The large stand-alone tiles are backed by soft sheets of cork or foam, suitable for horizontal display on table top or vertically on display easels. 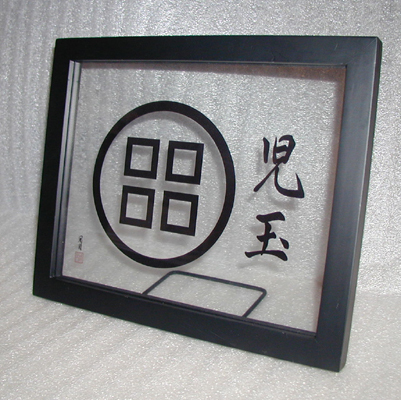 Mons are also made to order in the see-through frames, as pictured below, as well as in any of the beautiful frames available in our frame selection. 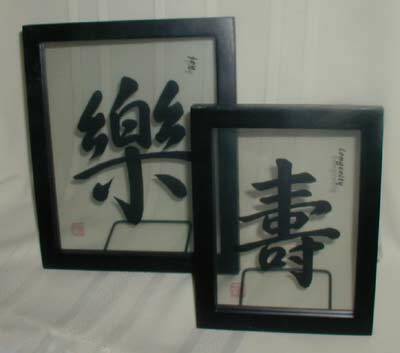 Since the complexity of the crest designs varies, the calligrapher will need to see the crest design for evaluation of the level of effort required, before a price quote can be provided. 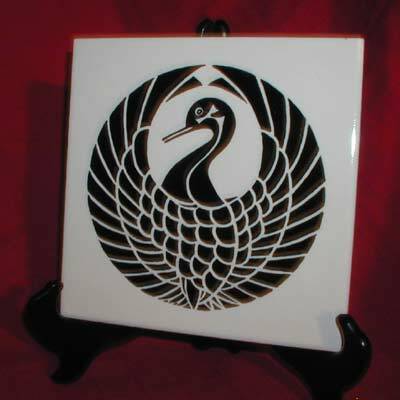 Please contact Cecilia by phone or e-mail for a free consultation to discuss your requirements and what we can achieve for you. 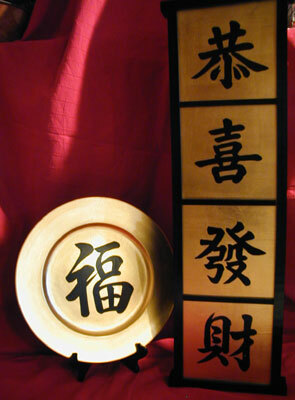 Family names are important for signifying the lineages and locale origins of families. 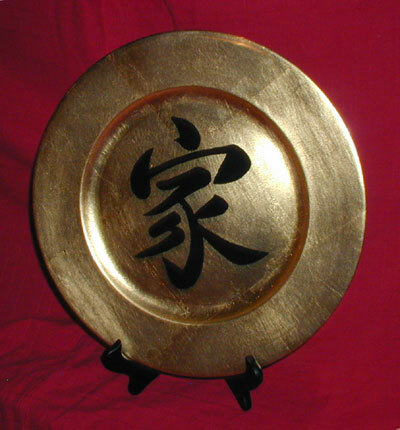 Family names are often proudly displayed at residences. 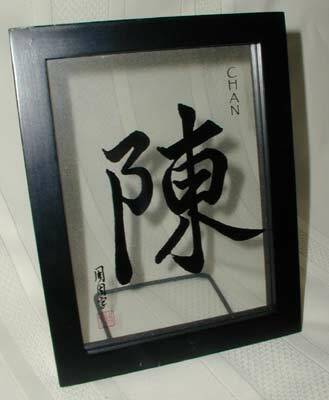 Your family surname may be hand-painted by InCharacter Calligraphy. 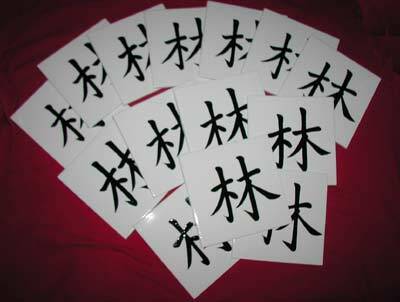 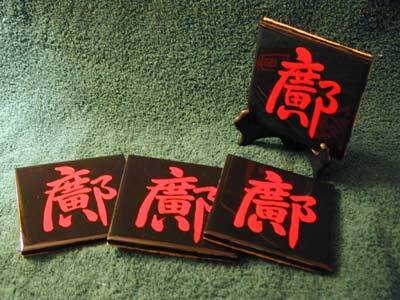 Even spoken in the same dialect, many Chinese characters have identical pronounciation. 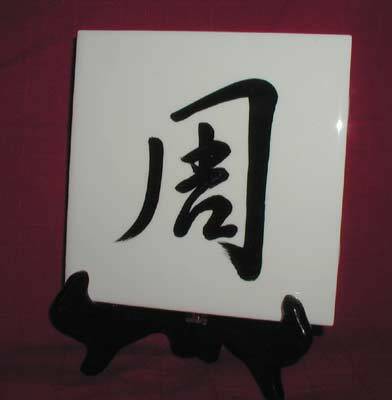 Also, the phonetic translation of a word from Chinese (or Japanese) to English is not unique, therefore it is essential that you can identify the specific character(s) associated with your surname. 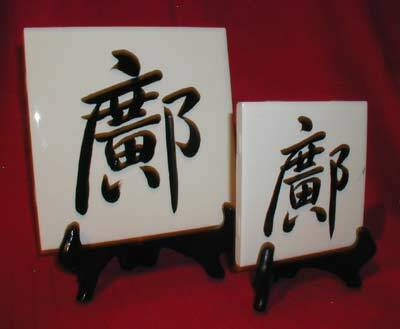 Here are a couple of web links to view lists of Chinese surnames (you may need to change your browser view settings to 'Encoding - Chinese Traditional (Big5)' in order to view these characters). 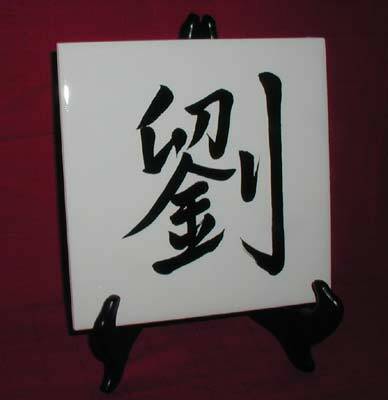 For the pricing of a surname, please contact Cecilia.